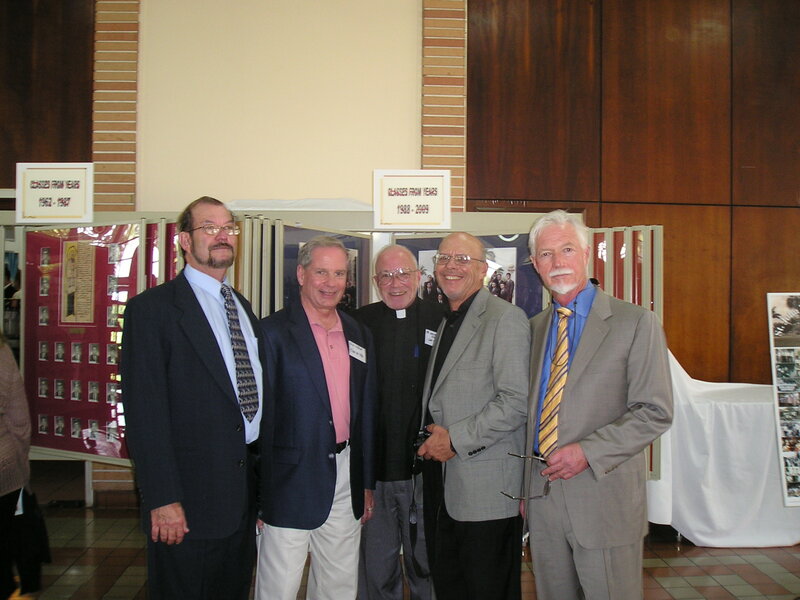 I hope you were able to join us for the The St. John Vianney Seminary 50th Anniversary. It was wonderful! So many memories, so many old friends, some we were meeting for the first time. While this was the first time I met most of you, I couldn't help but feel a brotherhood. So many times I heard an old story or joke started by one of you, then finished by another, yet you may have never met before. Throughout the weekend it became clear that we're all linked to each other through SJV and especially our time with the Vincentian Fathers. For the perspective from a current seminarian, as it was happening, please check the Thomas Pringle Vocation Blog. Over the next few weeks I hope to be able to add thoughts, pictures, sound and video from this event. Keep checking back as it will take me a while to type up everything and process the media. If you would like to have any of these images, please right click on the image and do a "Save As" so it will download to your computer. In advance, I must apologize about the audio quality of the videos I recorded. I was not connected to the sound system so some of the voices are distant and have echo. Hopefully you'll be able to understand most of what was said by the speakers. I have to tell you, it was very powerful and memorable in person. A special thanks to all the current seminarians. They made us all feel welcome the entire weekend. As you may remember, there's no seminary staff for the dirty and heavy work. As soon as one function was over, they were working hard to get ready for the next. The whole time with smiles and enthusiasm. They really were happy to have us back home again. I was also totally impressed with their knowledge of the campus including the history. We had a great exchange of information. They told me some interesting details about the Chapel I had never heard before. So it is quite clear that our school's tradition and history is being maintained well into the future. If you're wondering how SJV is doing today... they have a record enrollment this year. 74 college students, the highest since it became a four year college. The College building is full and they have students living in a home just off campus. First, for those I met this weekend, it was an honor and privilege to see those who have encouraged me to keep this web site going. I will. I heard so many wonderful stories and updates about your classmates. Unfortunately, there's no way I would ever be able to remember everything you told me. So please, send end an e-mail with anything you would like included here. A message of hope for the first Sunday of Advent: The Miami Herald article published today on St. John Vianney. Bryan Garcia has an ear for Linkin Park and the Black Eyed Peas, feet for dancing salsa, a guilty pleasure in sitcoms, a love of soccer and a habit of slicking back his dark brown hair. But something sets this 21-year-old apart from the typical college student: He's studying to be a Roman Catholic priest. Garcia is one of 74 men at St. John Vianney College Seminary in Westchester. While the church nationally is coping with a shortage of priests, you wouldn't know it from St. Vianney, which is experiencing its largest enrollment in 3 ½ decades. "From pranksters to priests" See the article from the Archdiocese web site. One of the first events on Friday was a morning of recollection in the Chapel of St. Raphael. Included were testimonies by priest alumni, lay alumni and faculty. Hosted by Msgr. Terrance Hogan (Class of 1972), speakers were Msgr. Pablo Navarro, Mr. Bill Horton and Dr. Charlie Cox. If you like the Reflections page on this site, you will like this. Click here to see the video (11 Megs) I'm sorry for the poor audio. The entire video is an hour. When I have time I'll try to break this into smaller sections; one for each speaker. Msgr Carruthers gave us his thoughts about the reunion. A very short video from the Cocktail Reception held between the Refectory and the High School Building. Special Guest, Fr. Rev. Charles F. Krieg C.M. and Dan Kroger share a story over dinner at the Banquet. College Class of 1974 (HS '72), Fr. Arthur Prolux, Andrew Frosh, Francisco Tejidor, __________. The 50th Anniversary Mass celebrated in the Chapel of St. Raphael, with Archbishop John C. Favalora as the principal celebrant. I know the College recorded the audio and video of this Mass. When I find the links I'll add them here. Pictures of the music practice before the Mass. Click on the images to see them full size. Everyone gathers outside the chapel after the mass. On Saturday night, we joined the seminarians for Gaudeamus. The first grads had a few stories and even a routine ready to go to teach the seminarians the Greek alphabet. Click here to see it. Jackson and Blake, current Seminarians, entertained us on the piano followed by some final words by Msgr. Carruthers. Click here to see that. 50th Anniversary Reunion a Remarkable Occasion! Praised be Jesus Christ! Our 50th Anniversary Reunion weekend has come to close having not only met our hopes for it, but surpassed them. It was a weekend of joy, prayer, celebration, hope, and healing. Various event over the course of the weekend allowed for many layers of experience. A cocktail and welcome reception Thursday evening was followed by a very profound sharing in a morning of recollection on Friday. Tours of the buildings Friday afternoon lingered on as long as the memories associated with the places on the tour. 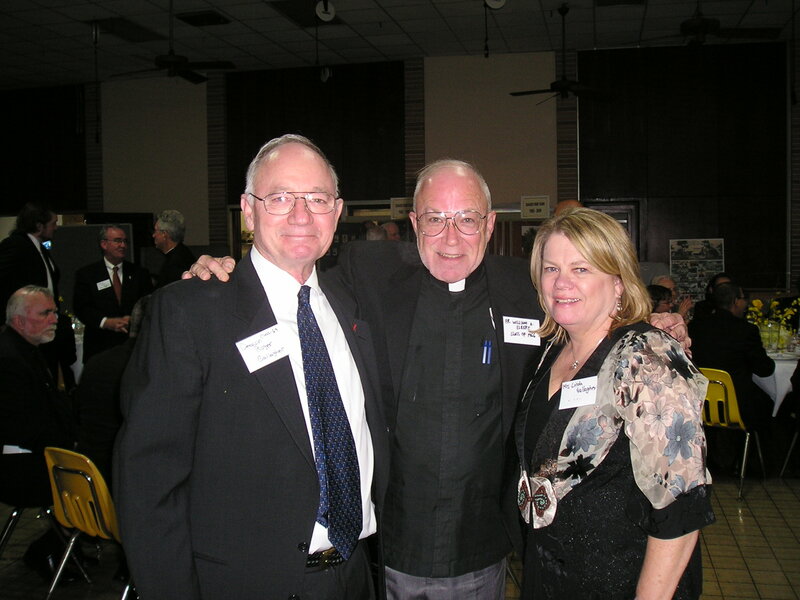 Friday evening over 300 people gathered for Solemn Vespers and the 50th Anniversary Banquet. The presider for the Vespers was Bishop John Noonan, former Dean of Men, Rector, and a member of the class of 1979. Also present were former rectors Fr. Bernard Kirlin and Fr. Thomas O’Dywer. The dinner really felt like a family gathering, even though many people from different eras had not met. Saturday morning we gathered for the key event of the 50th Anniversary year: The celebration of the 50th Anniversary Mass. Archbishop Favalora was the main celebrant and homilist. About 300 people were present for the mass, including roughly 50 concelebrating priests. The Archbishop presented the seminary’s highest honor, the Cure d’Ars Award, to the Vinentian Fathers. Following the mass, all present gathered in the refectory to continue the stories of the weekend. Sunday morning we gathered for Solemn Morning Prayer and the closing Mass of the anniversary weekend. A family cookout followed, and some alumni were present with their children and grandchildren. It was a very beautiful and relaxed way to end the weekend. The Golden Jubilee year continues, and other events will be taking place in honor of this milestone. Still, the seminarians of the house can rest with tremendous joy at the work and honor they gave this weekend for the good of the seminary and the glory of God. I wish to thank all who worked with joy to make the reunion weekend happen. Truly the Lord was present to us all. God bless. Our 50th Anniversary Year events continued this evening with the start of the Alumni Reunion. A welcome cocktail reception was held in the refectory for those guests arriving early. Present for the evening’s festivities were two gentleman who were seminarians here in 1959 when our doors first opened. Some of our current seminarians entertained the guests with background music. Wonderful appetizers were available, as well as an open bar. A display of historic photos and artifacts, including the first seminary journal, was present. The alumni were extremely excited to be back on campus, and the stories and memories were flying. All eras of the past fifty years were represented. For some of the alumni present, it was their first visit back since graduating. 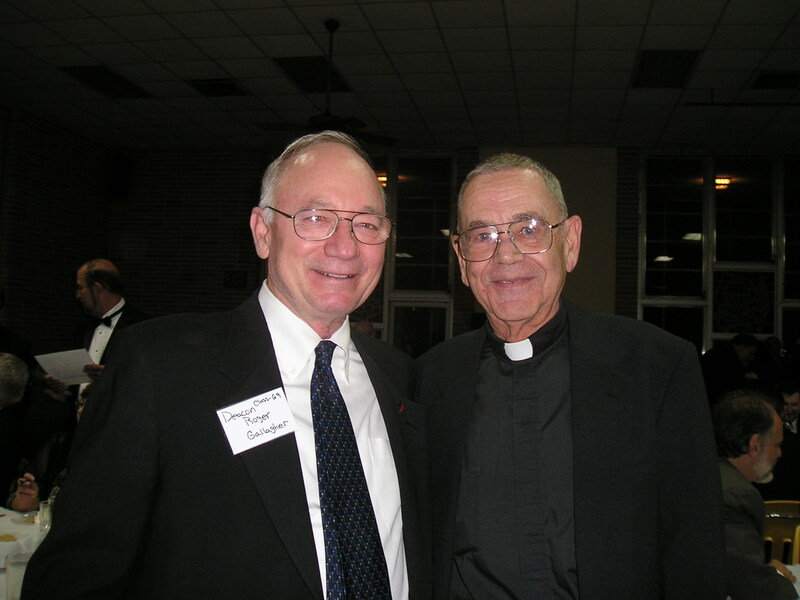 At the end of the evening, Chief Freddie Maas (Class of 1970) and Msgr. Terrance Hogan (Class of 1972), the Honorary Co-chairs of the reunion, greeted all present. The guests were then given various options of nearby restaurants to continue visiting with each other at dinner. They left very anxious to begin the next day’s festivities. This morning, the Alumni Reunion weekend continued with a morning of recollection. Certainly a reunion is a time to reconnect with old acquaintances, tell old war stories, and reconnect with a place and time important to one’s heart. But a reunion at a seminary needs to be much more than that. A reunion for a seminary is an opportunity to encounter Christ, to experience the hope only he can offer, and to be nourished by his healing hand. In order to point to Christ in the midst of all other festivities, a morning of recollection was prepared, setting time aside to focus on the Lord that we might see him in the midst of all the other activities of the weekend. The morning began with hospitality in front of the chapel. We then went inside to begin our time with Mid-Day Prayer. Two seminarians presided over the prayer, and the current Rector, Msgr. Michael G. Carruthers (Class of ’87), gave a brief reflection to set a tone for the morning. He invited all present to look for the Lord in the midst of the stories and memories, in the laughter and community, in the times of prayer and praise, and even in the hurt and pain that may bubble to the surface of the heart in the course of the weekend. After a brief break, we returned for a panel sharing, which was moderated by Mgsr. Terrence Hogan (Class of ’72). One priest alumnus, Msgr. 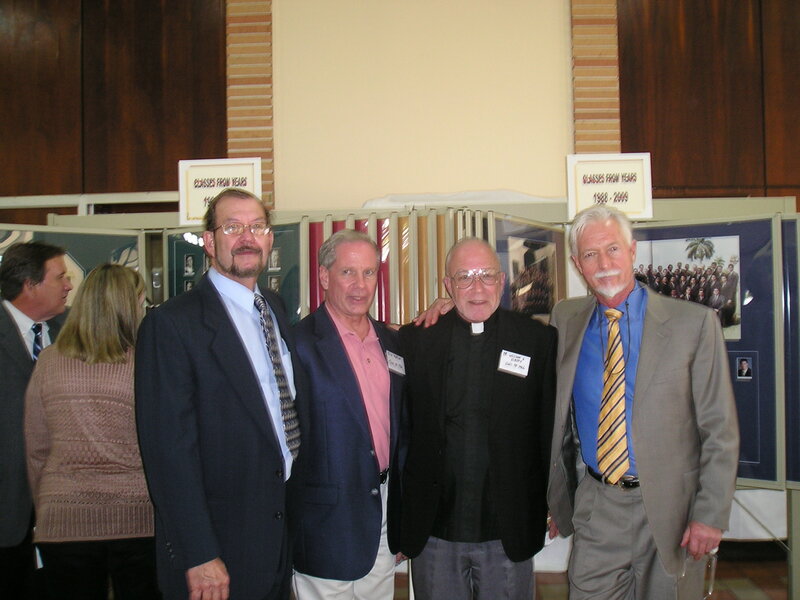 Pablo Navarro (Class of ‘71), one lay alumnus, Mr. Thomas Horton (Class of ‘72), and one faculty member, Dr. Charles Cox, shared their reflection on the graces that still flow in their lives because of their time at St. John Vianney Seminary. Dr. Cox mentioned that it was his time here at St. John’s that gave dignity to his career as an educator. That dignity came from the fact that “here I was on Her Majesty’s service, not Elizabeth II reigning in England, but Her Majesty, Holy Mother Church.” He reminded us that we are all lifted in nobility and dignity because of our association with St. John Vianney Seminary. We then turned to the Lord in adoration of the Blessed Sacrament. With the assistance of seminarians, Fr. Jose Alvarez (Class of ‘98), the Dean of Men of the seminary, presided over Adoration and Benediction of the Blessed Sacrament. This evening two of the key events of the Golden Jubilee year took place: Solemn Vespers and the 50th Anniversary Banquet. Over three-hundred people gathered in the Chapel of St. Raphael for the Solemn Vespers from the Common of Pastors, in honor of St. John Vianney. Bishop John Noonan, the ninth Rector of St. John’s and a member of the Class of 1979 presided over the prayers. Also present in choir garb were Bishop Barbarito, of Palm Beach, Bishop Wenski of Orlando (and a member of the Class of 1970), and Bishop Felipe Estevez, Auxiliary Bishop of Miami. Bishop Noonan reminded us that it is the people who have been a part of St. John Vianney that have, in God’s grace, made it such a special place. After the Vespers the crowd made its way to the portico of the refectory for preprandials. Once inside the refectory, Fr. Bernard Kirlin, our sixth Rector, led us in grace. Grace was followed by three traditional toasts, the first coming from Fr. Arthur Prouxl, Class of 1974, to the Pope. Fr. Prouxl thanked the Holy Father for declaring this year a Year for Priests and choosing John Vianney as its Patron. The second toast was to the Archbishops, and was given by Fr. Alejandro Rodriguez, Class of 2003. Fr. 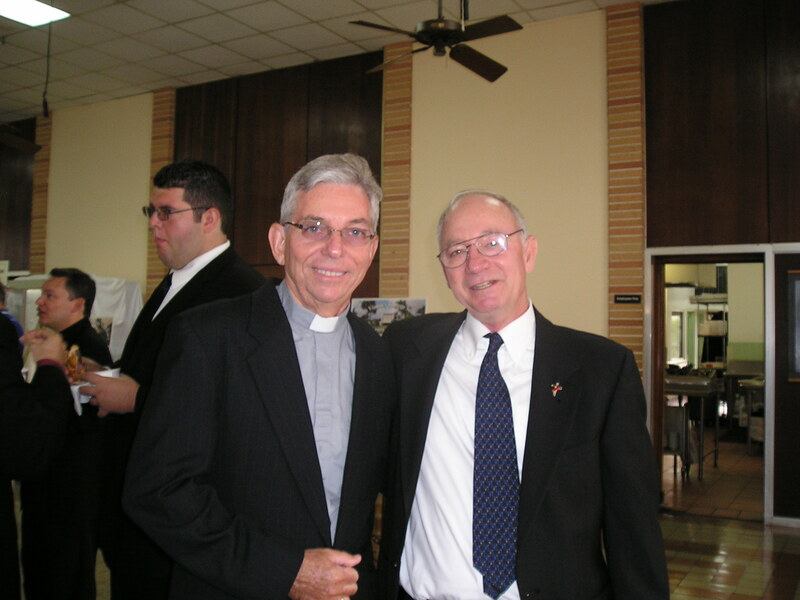 Alejandro recalled Archbishop Carroll’s vision, shared his personal memories of seeing Archbishop McCarthy prayerfully walking the property of St. John during his retirement, and thanked Archbishop Favalora for his strong support of the seminary. The third toast came from Fr. Thomas O’Dwyer, the seventh Rector. He toasted the seminary, and he recalled the days in which many were attempting to close it. He gave thanks to God for the seminary’s continued ministry and looked forward to the next fifty year. After a wonderful dinner, Chief Freddie Maas, Class of 1970, the MC for the evening, introduced the guest of honor, Fr. Charles Krieg, CM. Representing the Vincentian Fathers, Fr. 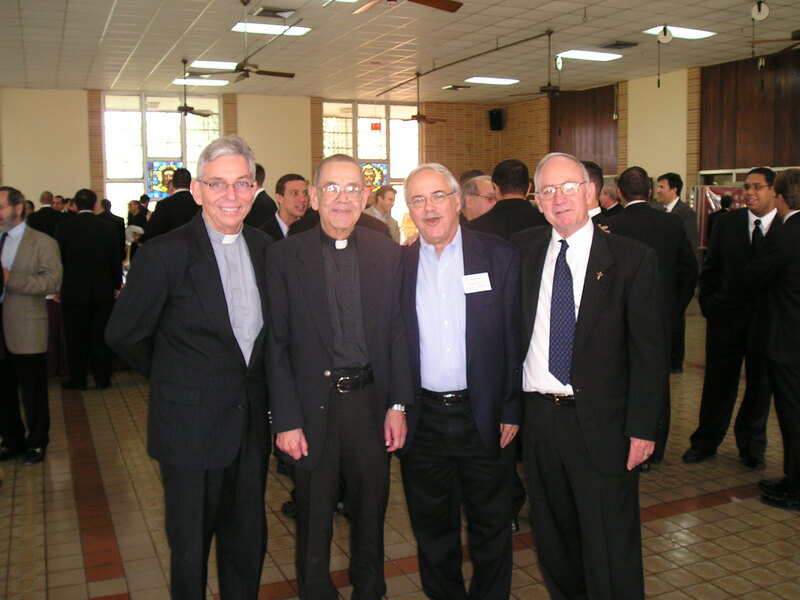 Krieg recalled with humor his sincere affection for his “boys,” the seminarians who were with him at St. John Vianney. Following Fr. Krieg, we were treated to a wonderful slide-show of photo’s chronicling our 50 years. Msgr. Michael Carruthers, current Rector and a member of the Class of 1987, then said a few closing remarks and led us in the singing of the Salve Regina to bring the evening to completion. 6:30 p.m.A welcome reception will take place in the refectory for those already in-town. It will be a short chance (6:30 – 7:30 p.m.) to meet each other and plan ways to share with each other during free times. Cocktails and hors d’oeuvre’s will be served. A list of local restaurants will also be available. 10:00 a.m. A morning of recollection will take place in the Chapel of St. Raphael. Included in the morning’s events will be testimonies by priest alumni, lay alumni and faculty. Among those scheduled to speak are Msgr. Pablo Navarro, Mr. Bill Horton, and Dr. Charlie Cox. Lunch will be available in the refectory, and other building will be open for tours. 5:00 p.m. Schola Practice. Yes, you read it correctly. All alumni interested in joining the current seminary schola for a meditation piece during the Friday Vespers (Fr. Buckley’s “Behold How Good It Is”) and the 50th Anniversary Mass can gather for practice. The piece for the mass will be Fr. Buckley’s O Sacrum Convivium. 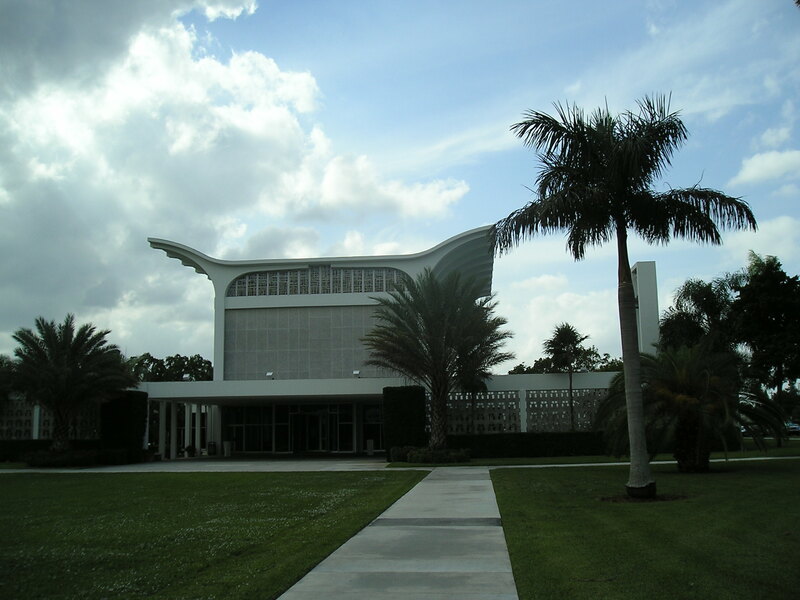 6:30 p.m. Solemn Evening Prayer will take place in the Chapel of St. Raphael to begin the evening’s festivities. 7:00 p.m. The 50th Anniversary Banquet will commence with cocktails on the patio area outside the refectory. At 8:00 p.m. we will be seated for dinner. Chief Freddie Maas will be the evening’s Master of Ceremony. 11:00 a.m. The 50th Anniversary Mass will be celebrated in the Chapel of St. Raphael, with Archbishop John C. Favalora as the principal celebrant. All active priest alumni are welcome to concelebrate (please bring albs). The mass will be followed by a stand-up reception in the refectory and its surrounding patio. 5:30 p.m. Evening Prayer will be celebrated in the Chapel of St. Raphael with those still in town. After that we will move to the refectory for a casual evening of Gaudeamus-like entertainment. Alumni are invited to sing and share. Heavy hors d’oeuvre’s will be available as well as guides to nearby restaurants. 10:00 a.m. Solemn Morning Prayer will be celebrated in the Chapel of St. Raphael. A Mass for healing, which will include the sacrament of the anointing of the sick will follow immediately. Active priest alumni are welcome to concelebrate (please bring albs) and deacons are welcome to vest (please bring alb and green stole). 11:30 a.m. The weekend will close with a relaxed family cook-out outside the community room of the college building. Keep checking back. Much more to come. Please send me any pictures, video or audio you have from either the Anniversary or your time at SJV.